I’m having a Holiday Open House Art Sale today, Saturday, December 7th from 10a.m. to 5p.m. 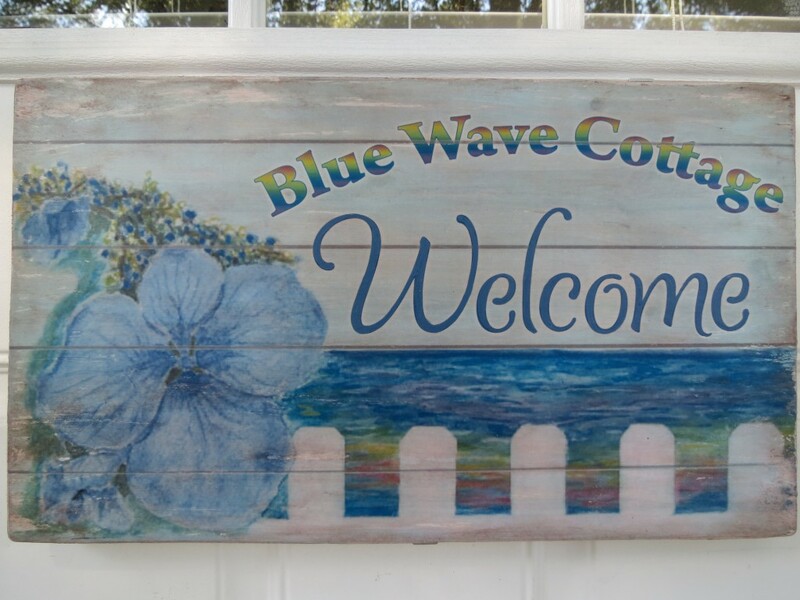 If you’d like to attend, send an email to kim@bluewavecottage.com and I will send you the address to my home, Blue Wave Cottage. I’ll be selling originals, prints, and note cards, and will have discounts on bin art. Come enjoy refreshments and holiday music while browsing through my creations. I hope to see you today and would enjoy the opportunity to chat with you! Remember, I’m offering discounts on bin art just in time for the holidays! Bin art is work that is matted but not framed; most of it is original work, although I have a few prints available. I also have framed originals and framed prints for sale. Find that special gift for that special someone, or take home a piece of art for yourself! The image above is one I designed and made in to note cards. It has a beachy feel with a little holiday flavor to it, and would make a nice card to send as a holiday greeting. I have several packages of 4 available as well as the original, which is triple matted and in a beautiful frame. Plus there’s so much more to see and enjoy! Hope to see you here today! I haven’t posted in a while…thought it would be fun to show you some of the stages in my painting process. 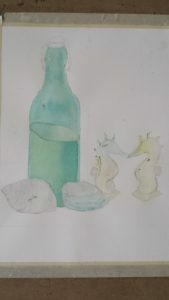 I chose to use a watercolor painting I did in my art class with Ruth Bailey. The title of the work is “Wedding Treasures”. 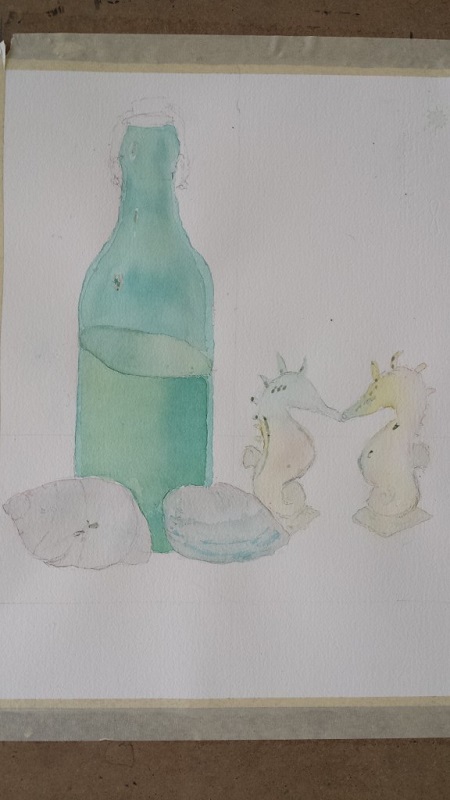 It’s a still life painting of our wedding sand bottle and cake topper (seahorses), along with a couple of seashells. The first picture is simply the set up of the objects to be painted; as you can see, I ended up painting it from a different angle. I wasn’t super concerned about exact proportions for this one and used the set up more as a guide rather than attempting to realistically copy it. My focus was on the colors and mood as well as working on painting glass. Next, you can see me at work in the beginning painting stages; I had already sketched it in pencil. The third picture is the painting before the background and tablecloth were added, and before much shadowing had been done. 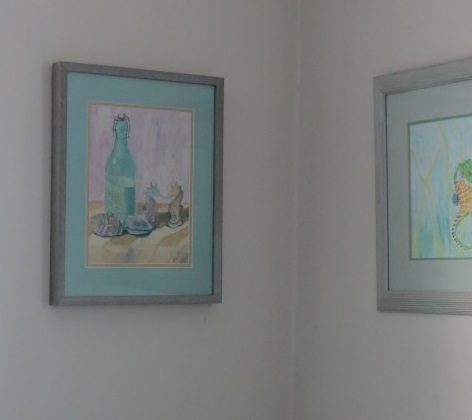 Finally, the last picture shows the completed painting, matted and framed, hanging on our bedroom wall next to one of my earlier watercolors called, “Seahorse Romance”. I really love this piece as it has sentimental value to me and has some of my favorite colors in it, especially the aqua blue! Art Reception, Live Music, Food! Join the Fun on Friday, October 11th, 7-9pm! I’m having an art reception on Friday, October 11th from 7-9pm at Wellsview Cottage in West Annapolis (510 Pafel Road, Annapolis, MD), complete with food and live music! Come check out my art work while enjoying some light refreshments and amazing music performed live by MAJI’! All of my work, both originals and prints, will be available for sale, just in time for some early holiday shopping! Also, I have a special running through the end of October; for all art purchases between $100 and $200, I’m offering a 60-minute Reiki session with me for $40 (regular price, $60 for 60 minute session) and for all art purchases over $200, I’m offering a 60-minute Reiki session with me for just $20! So take advantage of this offer and let me help you get a fresh, relaxing start to the holiday season! $10 suggested love offering to cover the costs of food and entertainment. MAJI’ creates hypnotic sound-scapes with timeless appeal, while honoring the diverse spirits and wisdom of the ancestors. This innovative world music fusion features a harmonious unique blend of multi-cultural instruments. Presenting winds and ‘rhythms from around the world’ including Native American Flutes, Hang Drums, Tibetan Singing Bowls & Bells, with African, Middle Eastern and Native American Drums. Gary Hardnett: Gary (Shen-Mu~Lightning Spirit) was introduced to the healing power of music after being struck by lightning. Hardnett believes his ‘sorma‘ (secret medicine) for success has been integrating kindness, compassion, and truth as keys to life. His “musical massages” & “singing bowl refreshments” have inspired others to shape and share more of the balanced and harmonious Light that is flowing through us. Gary’s Native American Flute playing has been featured on multiple musician’s CD’s and his Hang Drum’s deep, resonant, vibrating tones anchor the harmony of MAJI’s music. He is founding member of Maji’ and Earth Music Effects’~ EME’- Yoruban for “Divine Breath”. CD’s ‘Floating Om’ and new CD ‘Divine Breath’, show the musical versatility of the Hang Drum, Didgeridoo & Native American Flute’s melodic soothing voice. A martial artist, bronze sculptor, motivational speaker and musician who also practices Tai Chi,Qi Gong, and meditation with his beautiful wife, Sylvia. They share a wonder-filled life togetheron the South River, in their Annapolis dream home he designed and built. HOPE YOU’LL JOIN US FOR AN AWESOME EVENING OF MUSIC AND ART!!! Check out these pictures of my beautiful new door sign, made by the talented Ann-Marie of Words by Design…she did such an amazing job!!! She took my logo design from my business card and incorporated it in to a lovely cottage-y looking sign. View her site where she explains how she did this! Welcome to my beach cottage! 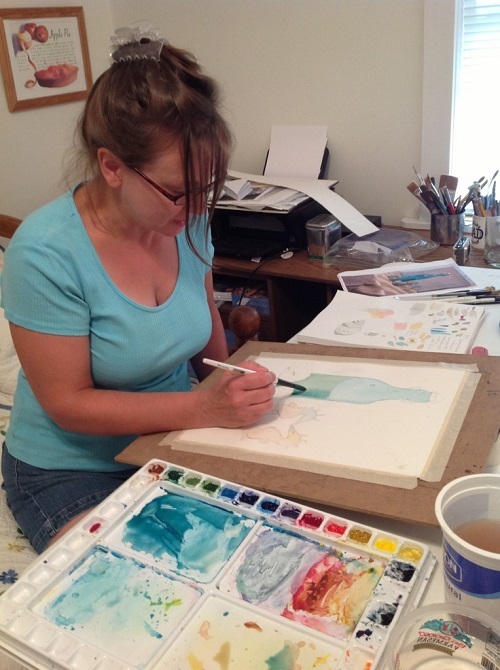 Wellsview Cottage Art Exhibit – Buy Art, Receive Reiki at Deeply Discounted Rate! I want to let everyone know that ALL of my finished art work currently available for sale is on display at Wellsview Cottage in West Annapolis. It will be there for at least another month, possibly through the end of October. This is an appointment-only wellness center, so why not schedule a Reiki session with me, or a massage, acupuncture, or another wellness offering with one of the other practitioners at Wellsview? You can view my art while there and maybe do a little early holiday shopping, or buy something for yourself to fill in that empty space on your wall that needs a pop of color! So far I’ve sold four pieces in the exhibit! Woohoo! I’m offering a special from now until the end of the exhibit. Purchase art work for between $100 and $200 and receive an AMAZINGLY relaxing one hour Reiki treatment from yours truly for just $40…that’s $20 less than the normal $60 fee! Make an art purchase over $200 and I will offer you a one hour Reiki session for just $20…yes, $20!!! That’s crazy inexpensive!!! Check out images of the lovely, relaxing Wellsview Cottage at the bottom of my Reiki page. Check out images of my art work on my gallery page. Everything available at Wellsview is in my image gallery, although not everything in the image gallery is available. Most pieces are original watercolors, a few are acrylics. I also have some giclee prints for sale. 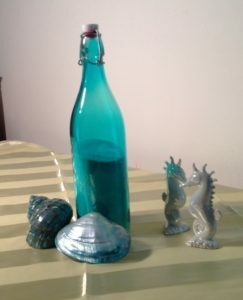 Contact me for pricing…all prices are posted next to each piece at Wellsview Cottage. Just mention that you read about this incredible offer on the Blue Wave Cottage website when scheduling your Reiki session with me! I love to paint, and I paint things I love. I also love to share my art with others, so I find places to display my work. Art is very subjective; some people will enjoy my work and others may not so much, but that’s just the way it is with art, and it’s really okay. Having said that, it brings me great joy when someone appreciates something I’ve created; and when someone likes something enough to buy it, well I’m simply ecstatic! Annapolis Wellness House is the place I first started painting while attending therapeutic art sessions. This charitable organization has a big annual fundraiser each summer called “La Fiesta”. This year I donated one of my pieces, “Purple Hydrangeas”, for the silent auction. I chose this piece because I painted it during an art session at Wellness House and these sessions have been, and continue to be, very healing for me. I wanted to donate something that was special to me. I was so happy to receive an email from the purchaser a couple of weeks ago, and she gave me permission to share what she wrote. She also included a photo of the painting hanging in her house. The deep joy that filled me when I read her message brought a huge smile to my face that stayed with me for days, and it still makes me smile when I think of it. Thank you so much for sharing, Mary Jane! It was very thoughtful and touching! I have mentioned Annapolis Wellness House as one of the wonderful nonprofit organizations that helped me when I was on my healing journey after being diagnosed with breast cancer. It has become a safe haven for me and so many others touched by cancer. I continue to participate in therapeutic art here as both a participant and volunteer facilitator as well as benefit from the multitude of other offerings such as Reiki, massage, healing music, restorative yoga, support groups, counseling, and special workshops, all free of charge, along with an array of delightful social events. I want to also mention two other amazing organizations that offered assistance to me during this most difficult time in my life. Critters For The Cure is a local nonprofit organization that helps women with breast and other gynecological cancers in a variety of ways. I was given financial assistance for medical bills, career coaching, and emotional support from this awesome charity and have stayed connected by volunteering in various ways. They also offer transportation to treatment, rent assistance, funds for vet bills, dog walking services, and a host of other things that a particular patient may need; truly a unique charity that’s worth checking out. I also received assistance from the United Breast Cancer Foundation in the form of a grant that enabled me to receive complementary care such as acupuncture, massage, reflexology and more at a local wellness center, all free of charge for an entire year. They also payed my health insurance premium for four months. These are just a couple of the many ways this organization reaches out to women with breast cancer and I have continued my relationship with this wonderful charity as well. I am thrilled to say that yesterday I sold my first painting through my website! The interested party sent me an email recently to ask the price (I don’t have prices posted). I responded with the price and other details such as the size and mat colors; all of my work is matted and some is also framed. She was still interested in purchasing so we met and, voila, my first “web” sale! I have sold art work previous to having a website, but it’s exciting to realize I have another avenue for sharing/selling my work! I have officially added “SOLD” under my “Sand Dollar” painting on my gallery page as of yesterday…woohoo! At this time I’m working on a couple other watercolor paintings that I hope to have posted soon. Please check back over the next few weeks! If you’d like to see some of my art work currently on display and the work of other local artists, please visit Ecoasis Garden Center in Bowie, Maryland. I also have some pieces on display at Annapolis Wellness House in Annapolis, Maryland. Yesterday was a very good day in more ways than one. I also had a massage from a fellow practitioner, Sofia Nitchie, at Wellsview Cottage, which is where I see clients for Reiki appointments. It was a wonderful, relaxing experience and she really worked out some tight muscles in my neck, back and legs. She is a unique therapist offering traditional and nontraditional massage treatments, and her lovely personality and warm smile add to the positive experience. Schedule a massage with Sofia, a Reiki appointment with me, and/or set something up for one of the many other wellness offerings available at Wellsview Cottage including acupuncture, Chinese herbal medicine, life coaching, psychotherapy, reflexology, Shamanic healing, and so much more!